Graphic imagery is used in this lesson. Please read the full post before teaching this. 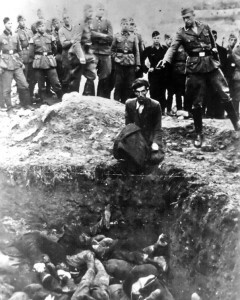 I start by displaying the famous photo called "The Last Jew in Vinnitsa." I say, "This was the title given by the Einsatzgrup soldier in whose pocket it was found, scribbled on the back. Vinnitsa is a small town in the Ukraine whose entire Jewish population was wiped out by the Einsatzgruppen mass killing methods in 1941." This is all I tell my students when displaying this picture. They have already learned about the Einsatzgruppen and read the selection on "Battalion 101" in Holocaust and Human Behaviour Chapter 7 Reading 3 . They have also been taught that there are three groups involved in genocide: perpetrators, bystanders, and victims.